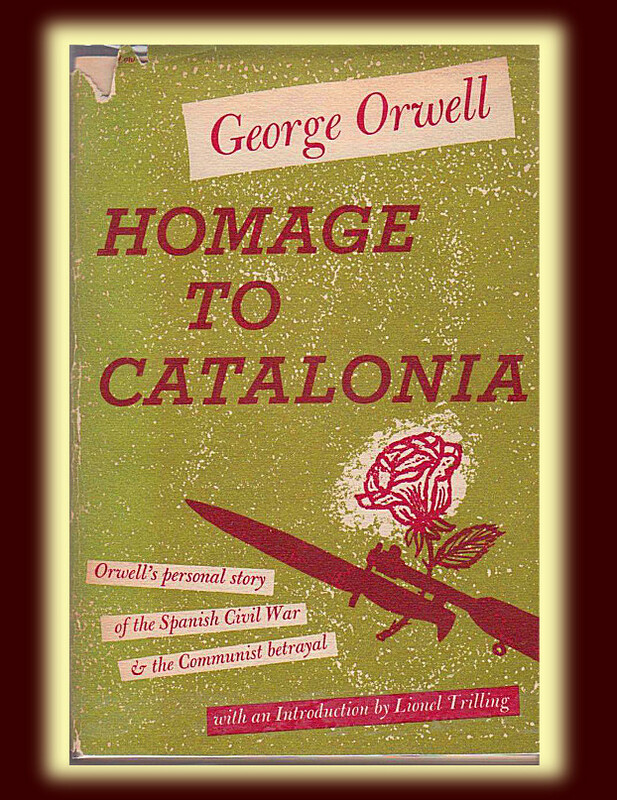 Homage to Catalonia (1938) is what it says, George Orwell’s homage to the people of Catalonia who attempted an anarchist/socialist revolution in response to the army’s attack on their fledgling democracy, and more broadly in response to centuries of harsh rule by feudal landowners supported by the Catholic church and the monarchy. A revolution that was brought down not by the civil war but by the backsliding of right-wing socialists in the Republican government and by the treachery of the Communists. In this it resembles (or presages) another account of anarchist ‘revolution’ undone by Communists, Daniel Cohn-Bendit’s Obsolete Communism: The Left-Wing Alternative(1968) about the Paris uprisings of that year and which I have owned almost since it was written. In fact, a great deal of Orwell’s book, particularly about the lies invented and propagated by the news media, serves to show plus ca change etc. Homage to Catalonia has two parts – Orwell’s memoir of his time as a volunteer soldier, and an analysis of the failure of the Revolution – written in the immediate aftermath of his service, “five months ago” as he says, and before the end of the Spanish war (1936-1939). The book contains a third part, Looking Back on the Spanish War, written in 1943. But that deals in particular with the partisan, dishonest role played by the press and deserves a separate review. George Orwell (1903-1950) is well enough known and I will not say much about him, except this: he is often claimed by the Right, especially for Animal Farm (1945) which is clearly an attack on Soviet communism. But let’s be clear. Orwell was of the Left, and like many of us still, was deeply upset by the descent of the Russian Revolution into bureaucracy and totalitarianism, a descent which he experienced personally in Spain. The POUM militia he enlisted in was broadly described as ‘Trotskyite’ – it wasn’t, but it was, and he was, committed to socialist revolution. And although Orwell was fighting firstly for the preservation of democratic government, he understood well, what we have mostly forgotten, that in the end ‘democracy’ is just another name for Capitalism. There was a shocking shortage of supplies for the volunteer militias, partly because the Republican government was wary of its ‘allies’ the Anarchists becoming too well-armed, and later, Russian-supplied arms were directed to the Communists and the International Brigades (Orwell is clear that, despite claims to the contrary in the right-wing press, there was very little Soviet army presence in Spain, although there were large numbers of soldiers from Fascist Germany and Italy). Not every soldier was issued with a blanket – in winter! – and Orwell’s first gun was an 1896 Mauser, for which he had just 15 rounds of ammunition. Many of the recruits were very young, as young as 12 in some cases, refugees from the poverty of the back streets of Barcelona, and it was not long before the government was reverting to conscription. The rival forces in this region had established fronts several hundred metres apart, along the tops of hills to the north and west of Barcelona. There was very little artillery on either side, and the constant rifle fire was inaccurate and uncoordinated. Occasionally one side or the other would make a sortie, often to gather firewood or the potatoes growing in untended fields. 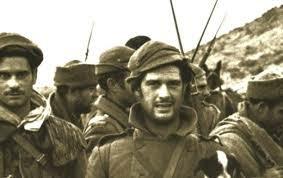 The government was attempting to retake nearby Huesca, and the Anarchists were attempting to cut the road north to Jaca, so Orwell’s section, in which he rose to corporal and eventually lieutenant – though all ranks through to general were on the same pay and orders often had to be argued rather than enforced – would sometimes be involved in fighting to divert Fascist troops from defending those more important actions. In the early stages the inefficiency of the POUM forces led Orwell to consider seriously transferring to the more efficient Communists in Madrid. But, while on his first leave in Barcelona, communist ministers within the government used government troops to regain control from the workers’ committees, and particularly the anarchist-controlled Telegraph Exchange (Wiki) . For a week Orwell was holed up defending POUM headquarters, although he and his opposite numbers in the building across the road maintained their own private ceasefire. Orwell analyses how it was always the workers who were asked by the government to forgo, in the name of winning the war of course, the freedoms they had seized in the beginning, and which Orwell begins to think they should have hung on to. An Anarchist patrol car drove up , bristling with weapons. Beside the driver a beautiful dark-haired girl of about eighteen was nursing a sub-machine gun across her knees. Orwell’s wife (he doesn’t mention her name) is in Barcelona, and at one time when an attack is imminent she establishes a first-aid post, but otherwise she is mostly out of sight. Orwell returns to the front, with a unit of mainly British volunteers, is wounded, shot through the neck. His description of the transport and hospitalisation of the wounded is horrifying. He finally gets back to Barcelona, with validly stamped discharge papers, to what he thinks will be a night at last in a hotel bed with his wife, only to find that POUM has been proscribed and he is now a wanted criminal. Shades of our own retrospective terrorism laws. The leader of POUM, Andreu Nin is in jail and has probably already been murdered. Orwell’s commanding officer, a Belgian wanted in his own country for the ‘crime’ of fighting for the Republicans in Spain, is arrested and by the time of writing had almost certainly been shot. Orwell and some other British stay in hiding and eventually make their way back to France. A wonderful book, which to all you lefties out there I recommend unreservedly as an essential part of your education. A new though less competent Franco has seized the United States. The Revolution is coming! Sue at Whispering Gums, reviewed Orwell essays on book reviewing, Bookshop Memories, and Books v Cigarettes. I guess your mum could have, if she was a street urchin (and a boy), and didn’t mind being with the Trots. Think the IB may have had higher standards. In fact, according to Orwell, there were very few women near the front. Great write up Bill. I read a bit of Orwell about ten years ago having only read Animal Farm and 1984 in my youth. I creating enjoyed this and Burmese Days. I wrote up a few of his essays on my blog in its early days. He’s a great writer – and I really, one day, want to read Down and out in Paris and London. I must say, I had always thought of him as a leftist, despite Animal Farm. He wasn’t stupid after all. Oh, thats irritating isn’t it? Thanks Sue. If I remember what I wrote, it was that Orwell is a favourite of mine, particularly Homage and Down & Out, and one of the great writers, for his effortless and to-the-point prose. 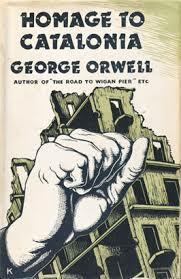 Will add links to your reviews of Orwell essays. He is great, isn’t he? And thanks.